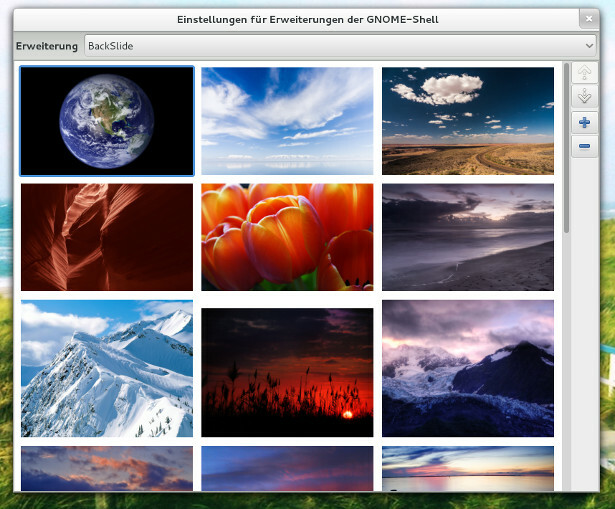 A simple Gnome-Shell Extension for an automatic background-image (wallpaper) slideshow. The preferences page to manage the image list. The packages which include the above tools may vary across different Linux distributions. Check your distributions wiki/package list to find the most suitable package for you. git checkout gnome-3.8 # ONLY if you need to! All settings can be changed from the gnome-shell-extension-prefs-tool or from the command line. Although you can set them using the dconf-tool, using the frontend/widget is preferred!. dconf write /org/gnome/shell/extensions/backslide/image-list "['/path/to/picture.png', '/another/pic.png']"
Settings changed, using the dconf-tool will apply, after the extension is restarted. If you are a developer/translator and you want to contribute to BackSlide, make sure to read "DEVELOPMENT.md" or "TRANSLATION.md" respectively.